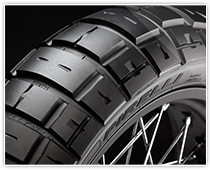 SCORPION™ RALLY STR is the new on/off enduro Pirelli tyre designed specifically for the latest generation of adventure, dual purpose and enduro street bikes. SCORPION™ RALLY STR is a revolution in the tyre segment because it manages to combine the best performance of a rally competition tyre with that of an enduro street tyre. Visible as a global sneak peek at the Ducati stand at INTERMOT, the latest Pirelli product is chosen by the manufacturer from Borgo Panigale as original equipment on the Ducati Scrambler Desert Sled. The new model will utilise it in sizes 120/70 R19 M/C 60V M+S TL (front) and 170/60 R 17 M/C 72V M+S TL (rear). SCORPION™ RALLY STR is designed specifically to meet the most demanding needs on the market with an aggressive tread and important technological innovations that provide traction on dirt roads, stability even at high speeds, handling and agility on the road, in addition to comfort and grip in all riding conditions. SCORPION™ RALLY STR was inspired by the winner of many competitions, the SCORPION™ RALLY, adding excellent road performance to the well-known off-road handling, specifically refined for use on large capacity adventure and dual purpose motorcycles. The new SCORPION™ RALLY STR is aimed at riders seeking versatility, balanced on and off road performance and a knobbly tyre with an aggressive look that does not sacrifice grip, safety on wet roads, mileage, stability and comfort.